Patsley became CEO of MoneyGram International – one of the world’s largest cash-transfer firms – in 2009, right after the financial crisis. Her job was to steer the behemoth to safety, all $1 billion-plus of revenue and 300,000 locations – and she did. She says her previous experience as CFO and CEO of two other other Dallas-based financial companies helped. Patsley didn’t come from a family of business people -- she’s the daughter of two schoolteachers from St. Louis – but she says she’s always wanted to be successful. In the S&P 500, there are only 22 female CEOs -- that's about 4.4 percent. Elissa Sangster, executive director of the Forté Foundation, says that low percentage is being reflected in North Texas. 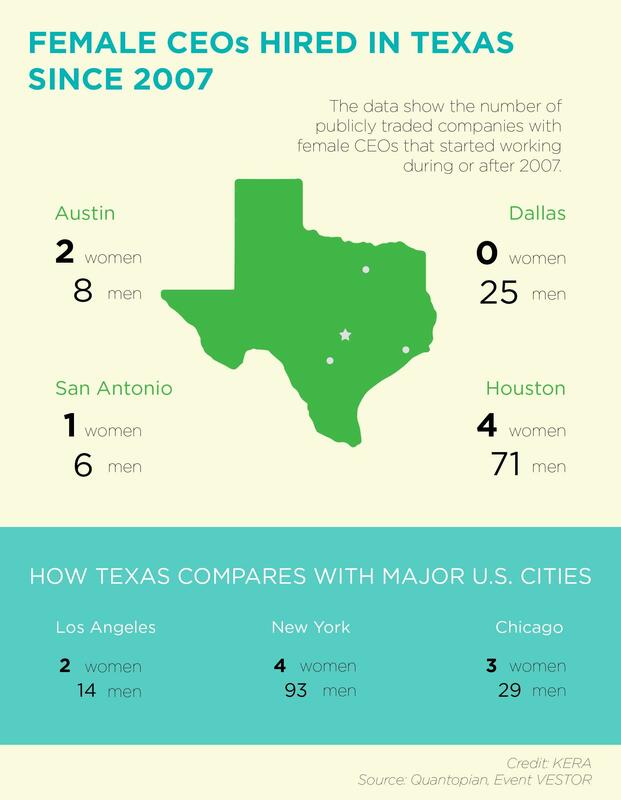 Her Austin-based organization seeks to put more women in top-tier business careers. Sangster says having women running companies isn’t just about equality. It’s good for business. “There are many research studies and cases that have been made for why having more women in leadership makes a difference in your corporation’s overall return on investment your return on equity,” Sangster says. Really? Good for the bottom line? Entrepreneur Karen Rubin was skeptical. She’s product manager with the Boston-based trading platform Quantopian. She ran a simulation investing only in publicly-traded, women-led companies from 2002 to 2014. Still, you can’t stick a woman in the CEO spot and expect profits to magically rise. In fact, a study by the Peterson Institute for International Economics shows one female figurehead isn’t enough. In the research, profitability only went up when multiple women were in corporate leadership – but that was for companies that went from having zero women leaders to a 30 percent share. If Fortune 500 companies want to groom women for these top jobs, Sangster says they need to reach them at the very start of their careers. “Instead of having this mysterious career path they’re showing them the step-by-step ways to make it to the top,” Sangster says. Some parting advice from a woman who has made it -- Patsley with MoneyGram. She says find something you’re passionate about, work hard, and don’t be afraid to adjust a few chairs. Can The Private Sector Chart A Healthier Course? Can companies like Unilever and Pepsi help make us healthier? This week at the Aspen Ideas Festival in Colorado, corporate insiders reflect on their role in creating a healthy society. The health insurance marketplace is ten days old, and the traffic jam at healthcare.gov still hasn’t cleared up. That’s been frustrating for Texans and the people trying to sign them up. As part of our series Obamacare 101, we take a look at some North Texas companies who are celebrating, not complaining about the Affordable Care Act.